The next morning Haylie stood, leaning on the castellations of the tallest tower in Falinal, staring out over the vast expanse of land she felt she had been dragged all over, allowing the soft morning breeze to blow her coffee brown hair around her shoulders, the rising sun dancing in her emerald eyes. Elera suddenly emerged from the top of the long spiral staircase that lead to the roof, slightly out of puff. “Got lost sorry, I’ll get used to the layout soon enough,” she looked at Haylie and her face seemed sad and lonely, “what’s wrong Hay?” Haylie took a moment before she answered, as if she were trying to find the right words to express her feelings. “You wish to leave?” Elera asked sorrowfully. "Like I said as long as you are standing on the sun spot hill, when I send you back all will be fine"
"I want the others to come too, so I can say goodbye properly I’m going to miss you all so much." There was a long moments silence between the two girls, both reminiscing their last few months of friendship, adventure and their newly establish victory. Haylie’s mind raced through the new faces and fascinating people she had become acquainted with during her time in Lardinia, Dr Rafael in the Garroden Forest, all the Imps in the Louare Valle, Dracon, various kings and lords, and the rebels and Lardinian Elders who had followed her into the greatest war of the age. “Any point asking that question now? !” Haylie asked sarcastically, guessing at various possible answer in her head. “Well now I think you deserve to know, I sent the light through the gateway to the crystal cave to lure you here because, because you had such a good heart, full of love and compassion. But you were cautious, afraid to make big decisions, in short you had let your courage abandon you, I knew that if I managed to persuade you to stay in Lardinia and help me you might renew your courage and certainty of life. That is why I brought you here I needed the right mortal to complete the prophesy"
"Ok, very glad" They smiled at one another, both accepting the situation, Haylie was going home and everything would return to the way it should be. A couple of hours before sun set they all gathered in the courtyard, mounted their horses; Ebah and Grungen riding with Killga, and rode out together for the last time. Through the glimmering gates of Falinal they rode the short way to the small hill that was the, affectionately named, sun spot. They left the horses at the foot of the hill with all of their weapons and walked the rest of the way up the hill. Haylie had changed back into her normal white hoody, light blue shirt, black jeans and trainers for the journey home, she had also taken the Ventura sword with her to the top of the hill, as she wasn't quite sure what to do with it. “I wanted to give this to one of you but I didn't know who, and I still don't and I can't take it home, so I’m not sure what to do with it.” She held the sword out in front of her, it truly was a beautiful object to behold, the gold blade caught the sunlight from any angle, the roughly gilded hilt, with its jewelled inlays and engravings, and the handle itself, so firm and yet so light. 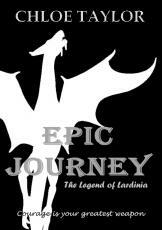 “I could keep it in Falinal for you, a reminder of Lardinia’s saviour.” Elera suggested. “But then why can't it be kept in Palistare, the sword has spent more time there on the journey to its destiny?” Fredrich argued. “I can’t have you fighting over it so," an idea suddenly came leaping at her, "I’ll leave it right here and here it will stay for all of time.” The others agreed and she held the sword handle tightly in her hand, blade pointed vertically towards the ground and with a mighty push she plunged the blade into the grassy earth, submerging a foot of the blade beneath the earth. Haylie nodded towards Elera who cast a spell over the gold sword, then tiny flakes of glass began to form around the sword, covering it until an entire block of solid, impenetrable glass formed around it. “There, now no one can disturb it but you and it can never fall into the hands of someone unworthy of its power.” Said Elera satisfied with her monument. The mood seemed to change and Haylie turned to Adiana and Aden. “we haven’t really known each other that long but it feels like a lifetime ago that you attacked me and Ringmore in Sherome, you are both brave and kind and I am glad to have met you,” she shook hands with the twins then turned to Fredrich, “you sire are a courageous and good hearted man, if a little short tempered, but I believe you will be a great king for your people,” then she faced Killga, Ebah and Grungen at her feet, “you are a fascinating person lady Killga, brave and caring, especially to you two, the bravest Imps in all of Lardinia,” subsequently she turned and faced Ringmore, “Ringmore Rider, the mystery unravelled, you taught me so much, without your training I would never have been quick enough to defeat Madelia. You have been an exceptional friend and I will miss you dearly,” finally Haylie reached Elera and she let out a long sigh fighting back the tears, “Elera, what can I say about you that I haven’t said before? You’re an amazing individual, devoted and kind, modest and courageous and the best of friends.” She looked around at the companions she would leave here and never see again. Finally it was time. Haylie stepped away from the best people she had ever known. With a final wave of farewells, Elera gave a gentle wave of her hand a single stream of pale blue light wound its way towards her, then a bright flash of the blue light engulfed her and in a moment the eight smiling faces had vanished and the dark, wet cave walls replaced them. Haylie lifted her watch to her face, the brilliantly glowing stone had vanished and the dark made it almost impossible to read the miniscule glow in the dark hands, they read ten past eleven, no time had passed since she had left Bryony Beach what seemed like months ago, she found her backpack on the floor where she had dropped it only seconds ago earth time, picked it up and manuvered herself out of the cave. She was drenched the moment she stepped onto the pebbles, the rain was still torrential but Haylie didn’t notice, she had been through worse than a soaking. She passed the house on the edge of the beach and smiled at the barking dog pacing the old wooden fence, paint peeling off its weather worn panels. She left the beach and strolled the puddle strewn streets, the street lamps passing by over head and reflecting in the small pools of water on the pavement below, finally she turned down her road and before her, bathed in the misty moonlight, rain pouring down the gutters, was her lowly house. Though in her mind it was far grander than any palace she had seen in Lardinia, she swung open the white washed gate and walked along the flag stone path to the front door. Quietly she tip toed through the hall, and paused to look at the family photographs hanging on the wall, how long had it been since she had seen her parents’ faces or her brother’s? She staggered up the stairs in the dark to her room, she gave her hair a rub with a warm towel, which she had hung on the radiator that morning, changed her clothes and perched on her window seat, letting her dark, damp hair drip down her back, she wasn’t going to sleep tonight. Haylie gazed out over the houses on the bank below hers and out to the sea, the moonlight still dancing on the waves, the rain disturbing the peaks, creating small circular ripples, streams running down her large window forming strangely shaped droplets that danced their way to the window sill outside. As she sat and witnessed the marvels of nature, she recalled each of her friends faces and the extraordinary places she had been, vowing in that moment never to forget a moment of her epic journey. © Copyright 2019 ChloPo359. All rights reserved. . . .Gifted. . .